WIPBI (Work In Progress Business Intelligence) is an internal project at Immedia which gathers the gained experience in similar projects we have performed for the European Space Agency. The objective is to create a cloud platform aimed to give support to some of the processes we consider as some of the most important in Project Management. We think these processes are not fully covered by current software tools in the market, although most standards and bodies of knowledge pay special attention to them, such as Project and Communications Control, and Stakeholders Management. To provide objective parameters to evaluate the real status of projects, using a quantitative management, based on metrics and KPIs widely used by Project and Portfolio Management professionals, and that it is reflectes in standards such as PMBoK and ISO 21500. 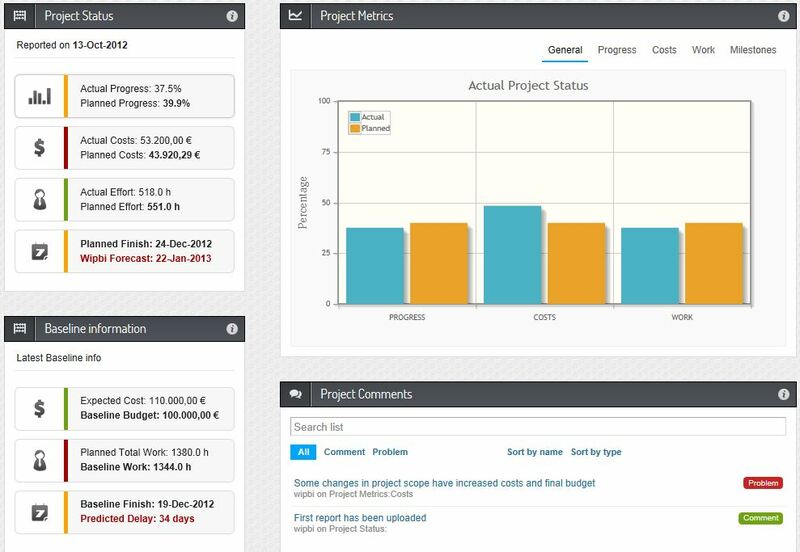 To help Project Managers in those communication and project status reporting tasks y reporting, translating calculated metrics into a un lenguajeeasily understandable for the rest of participants, both technical and non technical ones, so that, they can take their decission. The systems helps with communications managment, allowing process approvals, comments and opinions coming from the stakeholders. WIPBI underlines the importance of the Baseline, as it represents the initial commitments and expectations of the project, that must be fulfilled as long as the circumstancies allow it. The final objective is to provide an objective score of the project performance, allowing project oriented organizations to follow continous improvement strategies, and give then the capability to forecast the results of new projects. Use of best practices, widely accepted and acknowledged by Project Management experts.